I have to be honest and say that prior to being invited to take part in the blog tour for ‘Burning Secrets’, I hadn’t actually come across Ruth Sutton before. I am so glad that I was invited because I have discovered one cracking author. ‘Burning Secrets’ is one hell of a read and I absolutely loved it but more about that in a bit. Two of the main characters are female policewomen from very different backgrounds. DS Anna Penrose is from a military background. She was a member of the military police but she has transferred over to the civilian police. Penrose is not a woman that I found it easy to take to. She is very direct, she’s abrupt to the point of being rude and she is very much in your face. I wondered if she didn’t realise that she had upset people or she just didn’t care. Penrose is a new face in a new county and she feels as though she has got something to prove. Penrose is a bit nervous about being in charge of Pritchard given that Pritchard has been in the job for longer and she is so popular. DC Maureen Pritchard is an older lady with a lot more life experience and she has been a police officer for longer than Penrose. I did get the impression that she resents Penrose to a degree and it does come through in her interaction with her. Pritchard had a chance to go for promotion but she didn’t take it and now she is kicking herself. Pritchard is more of a people person and she is easier to get along with. I took to Pritchard from the start, whereas I didn’t take to Penrose all that easily. However, both ladies have to put their differences to one side and work as a team to investigate the disappearance of Helen Heslop. Will Helen Heslop be found? Is she still alive? Well for the answers to those questions and more you are just going to have to read the book for yourselves to find out as I am not going to tell you. This is one of those books that grabbed my attention from the moment I started to read. The story hits the ground running and maintains the pace throughout. I was hooked on this book by the time I got to the bottom of the first page. After that first page, the rest of the pages seemed to speed past. I just had to keep turning the pages to find out how the story concluded and to see if there were any twists and turns to the story. There were a fair few twists and turns, some of which I didn’t see coming. It seemed to take next to no time for me to get through the story but because I was genuinely enjoying the story, the author’s writing style and the characters so much I hadn’t noticed the time fly by. The saying ‘time flies when you are having fun’ certainly applies in this case. 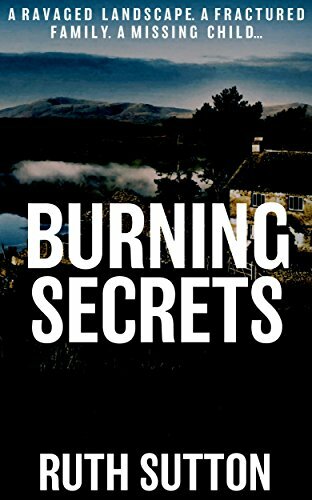 ‘Burning Secrets’ certainly had a bit of everything for me – there is an abundance of drama, suspense, shock and secrets, which are gradually revealed as the story continues. The author’s writing style is so realistic that I really did feel as though I was an invisible member of the investigating team and I found that I began to interact with the book. Before anybody starts, I do know that the book is fiction, I know it’s not real and I know the characters can’t hear me. I have a very vivid imagination and if I find a good book then I tend to ‘live’ the story, as well as randomly commenting out loud about something I have read or that the characters have done. The book is set in Cumbria which isn’t too far from where I live in the North East and it was lovely to read about places which are familiar to me. The book is set during the Foot & Mouth outbreak which devastated Cumbria and other farming communities. I can remember the F&M outbreak and the heart breaking scenes that followed. In short, I absolutely loved reading ‘Burning Secrets’ and I would definitely recommend it to other readers. I can totally guarantee that this will not be the last of Ruth’s books that I read and in fact I am determined to read her other books just as soon as I can. The score on the Ginger Book Geek board is a very well deserved 5* out of 5*.